The Magnificent Wine Co. "CAB" is a 100% Cabernet Sauvignon from Washington Stat's Columbia Valley. The winemaker Charles Smith has been making noise in the last few years for making some really high quality wines at great prices. Magnificent Wine Co. has two lines of wines "The Standard" and The "Originals". 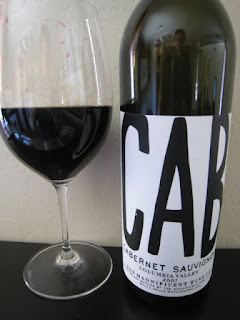 The "CAB" is part of the "Originals" category as well as a Pinot noir, Syrah, and Riesling. The famous a well-known "House Wines" are part of the "Standard" series. For more info. and tech data check them out here. The bouquet of this wine displays a classic Washington state Cabernet Sauvignon aroma of blackberry, coco, licorice, and spicy hints of oak. As I let the wine open up the aromas continue to unfold and intensify. On the palate the wine has a sleek texture that reminds me slightly of Bordeaux, meaning it's not overly viscous or thick. Flavors of luscious blackberry, cassis, chocolate-raspberry sticks, a touch of oak/spice lead into a medium length finish that displays only the slightest note of tannin. I've never tried anything from this winery but I'll check out Bev Mo to see if they carry it. I do believe I saw this wine at BevMo. The labeling is pretty recognizable so I am almost positive it is there. Magnificent has a very wide distribution and I frequently see it on sale. I know BevMo has carried it in the past. I am not sure if I agree that it is a classic Washington Cabernet style but at sale price <$15 it has great quality price ratio. I agree we have other Washington Cab with much more going on at the full price point but few of those are distributed regularly out of state. FullPull wines is a great way to learn about and acquire those wines.